A man kept nagging his mother to stop playing the lottery; he said it was just a waste of money. However, with the lunar new year holidays coming up, he gave his mother three numbers to use. The mother bought a ticket using the numbers from her son along with three of her own and finally won. The mother, who works as a street cleaner in Xiamen, Fujian province, was suddenly a millionaire. 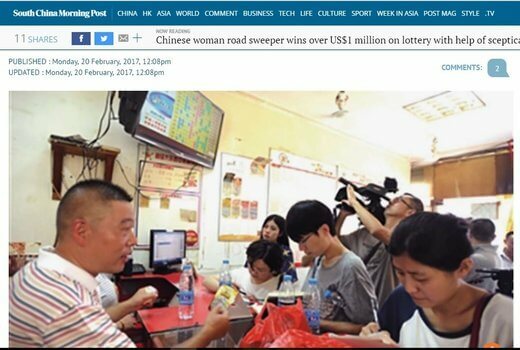 She had won 8.6 million yuan, which is equivalent to $1.25 million! You’d think she would want to retire from cleaning the streets, but no she won’t. She says she will save the money for her son and continue working as before. There is no word on whether the woman will continue playing the lottery, of if her son will still ask her to stop!